I went to Hong Kong, and I studied with a famous instructor there, and then in the US with another gentleman. I had studied watercolour years ago because I loved Hopper, Edward Hopper, and my grandfather was a painter, and my brother paints. I took it up as well. But I really wanted to understand what a forger might feel he has to do to duplicate that. On Jimmy Kimmel Live’s post Oscar show, Travolta finally explains the reason for flubbing Idina Menzel’s name at the 2014 Oscars. His excuses: he ran into Goldie Hawn backstage which got him off track, the prompter put the name onscreen in a phonetic form, and his 15 minutes to speak became one minute and 15 seconds. She’s had one of the best years of her career, and she gives me credit! Apparently, I played with her chin too much. 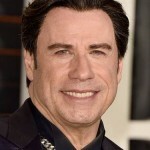 Travolta accepts the ALS Ice Bucket Challenge and nominates Olivia Newton John. 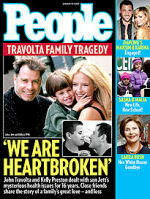 Travolta speaks to Letterman on how his family travels with him through filming and moments at home. He loves being a father. Recently he found that his daughter, Ella, is a great singer and his two year old son is a barfly. Get me a drink dad. Down the hatch. Cheers. One for the road. It is beyond shock—it is devastating. To bury your son is the worst thing you can ever do. It is beyond words.